The problems with Cornwall Council’s growth obsession | Cornwall – a developers' paradise? Cornwall – a developers' paradise? The story of the housing target. Or who do we vote for? What’s planned for your town? How the affordability racket works. We’ve seen how Cornwall Council is obsessed by its drive for ‘growth’, which, despite all the flannel surrounding it, turns out to contain at its core the same old-fashioned housing and population growth. There are four fundamental problems with its love affair with ‘growth’. The first I’ve already noted. Why should more of the same old growth have a different effect than the past 60 years of growth? As that growth apparently hasn’t worked shouldn’t Cornwall’s ‘decision-makes’ be looking for other solutions and not continue to rely on an outdated and discredited policy? The second problem is a question of arithmetic. Cornwall Council’s personnel appears to labour under the delusion that infinite growth in a finite space is a practical proposition. Hunched over their computers, they don’t appear to have looked out of the window lately. More resources cannot be conjured up on demand to cope with endless year on year ‘growth’. The Council boasts of a regional growth rate of 4% a year. No-one in Truro has had the temerity to point out to the leadership cabal that this means the Cornish economy will double every 17 and a half years. And then double again after another 17 and a half. And so on. It doesn’t take a GCSE in maths to work out that, at that rate, it’ll be 64 times bigger than now in just a hundred years. Even if we’re not talking of a population 64 times bigger and facing the problem of slotting 35 million or so people into Cornwall, the Council needs to tell us how it intends to sustain this rate of growth. Precisely how will it manage a 64-fold growth in consumption when it struggles to manage current levels? 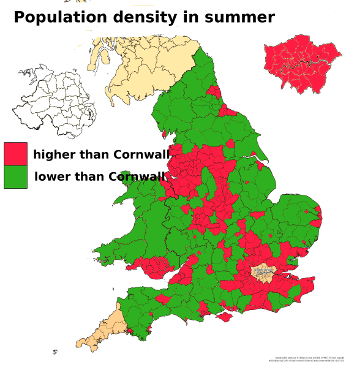 Most rural parts of England and Wales already have a lower population density than Cornwall in summer. If there was plenty of spare capacity, then one might understand why some growth is contemplated. But there isn’t. Mid and west Cornwall is already among the most densely populated rural parts of Europe. The annual tourist influx is already pushing at or over the limits of capacity. Moreover, the third, and increasingly salient, problem that the Council and its partners ignore is the growing realisation that we’re living through an unprecedented crisis of biodiversity and species extinction. This news does not seem to have penetrated Cornwall Council or its partners in crime. The ludicrous idea that climate change is caused by human activity is clearly one not shared by Cornwall Council’s leadership. On page 1 of New Frontiers, the basis for the Council’s request to London for a second devolution deal, it brags that Cornwall can be a ‘test-bed’ for ‘new approaches to the grand challenges facing our society’. The single most pressing ‘grand challenge’ is surely climate change. Odd then, that New Frontiers, while mentioning the word ‘growth’ 119 times, doesn’t once explicitly mention climate change. Even more shockingly, there’s no discernible evidence of any proposed environmental audit of their grandiose growth plans. There’s no calculation of the carbon footprint of building 60,000 houses in the next two decades. Or the infrastructure projects that will ‘unlock’ more housing. Or the spaceport. Or any of the other bombastic schemes that are being run up the flagpole at County Hall. 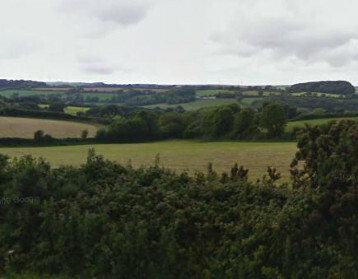 Countryside west of Truro. To the folk at County Hall and the developers just a great site for housing. Read the document and you get the impression that its authors live in a time-warp. We’re strangling the marine environment with plastics and killing ourselves on a daily basis by ingesting micro-plastics. But at County Hall the inmates are mysteriously stuck in the 1960s, blithely unaware of the dire effects of human activity on nature and the environment. We may be on the Titanic and the metaphorical icebergs are looming, but the crew remain blissfully in the dark about them. Finally, the fourth problem should be blatantly obvious, although it’s one that Cornwall’s political and economic elite don’t seem able to recognise, let alone empathise with. It’s the fact that their ‘place-shaping’ schemes are fast destroying what’s left of the Cornishness of Cornwall. They might not care about that. Indeed, some of them may even welcome it, arrogantly and condescendingly dismissing the Cornish sense of heritage as an unwarranted and illegitimate sense of ‘entitlement’ on our part. Yet, while they’re supremely complacent concerning the costs of growth, one fear stalks their dreams – the possibility of democratic oversight and control over their irresponsible activity. The final blog tomorrow will describe what measures the Council and its mates are taking to prevent that frightening possibility ever taking shape. This entry was posted in Cornwall Council;, population growth. Bookmark the permalink. What actions can we take now to put a stop to what’s going on? Also: what is really in this for the government?Apart from financial gain, what is their alterior motive? Living in the end times? The Cornish crisis ramps up. Are we building for local need? The data updated.